$60.00 As Low As $2.40 ea. 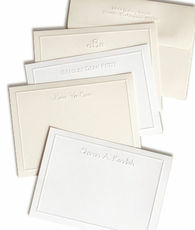 Elegant 5.75" x 3.875" foldover notes framed in a double-tier panel on white, ivory or pink paper. Set of 25 folded notes. Your choice of a name or a monogram. For a monogram, provide us with the initials wanted in the order they should appear from left to right. Blank matching envelopes included. Embossed return address available.